Designed in Italy, the C6 has a rugged yet lightweight annodized aluminum frame that weighs only 11lbs but comes loaded with features you would only expect to find on a full-size stroller! The 2 position reclining seat provides comfort and security with a padded 5 point harness. The adjustable, roomier, round canopy protects from the weather. The basket provides storage for all the things your baby needs. The front swivel wheels make this stroller easy to maneuver. The all wheel suspension gives baby just the right ride. 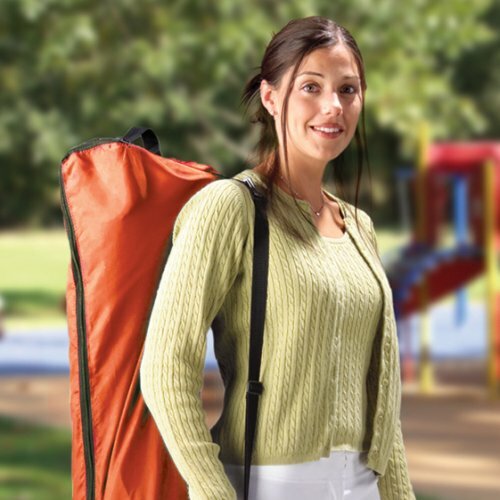 The stroller carry bag & shoulder carry strap make travel & storage convenient. Lightweight aluminum frame makes this stroller compact and highly maneuverable. Features a rounded, removable and adjustable sun canopy. 5-point safety harness with shoulder pads for extra comfort. Seat has two positions for baby's comfort. Front and rear suspension and lockable front swivel wheels provide a smooth ride. Comes with a carry bag, making travel and storage convenient. Recommended for age 6-36 months and up to 37 lbs. Ultra lightweight aluminum stroller weighs only 11 lbs! I love this stroller. I was scare because somebody wrote that the color was not as the picture but I love it, it looks the same to me. The stroller is well made, strong, a little big heavier of what I expected but no so much, still good for an umbrella. It is very comfortable. I bought it for my nephew but I even try my 4months old baby and he looks good on it that I will be getting the same one for him. I have the chicco stroller for my infant and love it. Chicco is such a good brand I find. Wish I would have bought sooner! We purchased this stroller couple weeks ago. I love how easy the Stroller folds down and how lightweight it is, but I wish, the handlebars would be sizeable and rubberized. Like the other reviews, I kick the wheels with my toes all the time. That is really annoying. Some adjustable handlebars would be great. Also Chicco could spend a couple more cents on rubberized handlebars for more comfort. But well, my baby loves to sit in it. This was a good stroller for the features it has. It is very light, already put together, collapses easy and the wheels are better than the typical umbrella stroller. I liked the 5pt harness best about it. Good for quick trips and stowing in your trunk. The cons are that the cargo basket is TINY and impossible to get to. The recline is almost nothing. The sun visor isnt as quick to pull out and back, you have to bend the lever, which isnt hard but it doesnt just collapse esily. This isnt the stroller for long trips. I actually bought the aqua color last year, but they are all pretty much the same. It is a good, lightweight stroller for a walk in the park or mall or a shorter daytrip. The basket is not large, but sufficient for a purse and small diaper bag. I quickly found out if you place too many shopping bags on the handle and take your child out of the seat, the whole stroller tips backwards! (yep, in the manual!) The travel bag it comes with is good for car travel, but got pretty beat up on one airplane trip. It's not made with strong material and the seams are weak. I needed a stroller that was light weight to get in and out of cabs yet sturdy enough for the streets. This stroller is perfect for just that. My son is 9 months old and we've been using this stroller for 3 months. We've taken it on an airplane as well as using it around the house and neighborhood nearly every day. It is lightweight, folds down and opens up easily (the locking clip improved a lot after some use) and I love the storage bag. When we gate checked it on the plane, it came back in great shape because the bag took all the abuse. It steers really well. I can easily walk the dog or talk on the cell phone and push/steer it with only one hand. Also, the tires are a good size and can handle uneven pavement and choppy ground. The neighborhood I live in has some rugged terrain, and the wheels handle the challenge nicely. My son is very comfortable in it and often falls asleep in it. It doesn't recline as much as some Maclaren strollers, but that hasn't been a disadvantage to us. It does have a limited size basket underneath, but it doesn't tip over with a diaper bag or other bags hung on the handles, so that hasn't been a big inconvenience either. I prefer the grips on the handles to the other curved handles of other strollers I "test drove" at the store. They seem to keep my hands cooler and are more comfortable to hold, but that's just my preference. You may find you like something else better. My husband is 5'8" and I'm 5'4" and we don't have any problems with the height of the handles, though I do occasionally find myself kicking the wheels. However, I did notice that I have more trouble with that when I wear a certain pair of shoes. The foot release to collapse this stroller is tough to unlatch with my foot, and if I'm wearing sandals (and in our hot climate I wear sandals a lot) I can't unlock it with my foot. I have to bend down and pop it open with my hand -- a definite drawback. However, it opens super fast and easy. We love this stroller !! This is a GREAT stroller !!! Lightweight, easy-to-use, and you can't beat the color orange! I have had lots of strollers between 4 boys and nothing beats this Chicco. People keep stopping and asking me where I got it - Thank you Amazon - Love it love it love it !!! My wife has the large Bugaboo she uses all the time, but I needed a stroller for our one year old to keep in the trunk of my convertible (BMW M3). This fit the bill. It is light weight, fits easily in my tiny trunk and my daughter seems happy in it. Does it have all of the bells and whistles the Bugaboo does? Of course not. Does it give me a place to put her when we are out running errands on the weekend. Yes. I am fairly short (5'4") and have absolutely no problem with the height of the handles. My only complaint is that occassionally my feet will hit the rear wheels when walking. When folded, two wheels end up at the top and two at the bottom. This means that if the wheels are dirty, there is no "clean side." Also, the dirty wheels will tend to make the sun visor dirty since they are in contact when folded. The buckle seems to work well although there is a velcro cover that folds over the buckle assembly from the outside in. I'm not really sure what the purpose of it is, but I guess it keeps my daughter from opening the buckle herself - not that she has the hand strength necessary. Well, I had other umbrella strollers, but my daughter could last no longer than 10 minutes in them. I ended up using our travel system stroller, but my back would be hurting as I lugged it in and out of our trunk. Thank goodness for this stroller! She can last forever in this one. The slight recline is enough to keep her comfortable and the backing helps her from looking slumped over. It is light and collapses just as easily as other umbrella strollers. I also like the five-point safety harness and great sunshade. Oh, and unlike other critics, my feet hitting the wheels while walking has never been a problem. I give it four stars b/c the material is not washproof and the keylime color soils easily (if I had known this, I would have purchased a darker color). Also, I thought it would recline more (only goes down 10-15 degrees from upright). Having said that, my daughter still seems to last forever in this stroller though! As a very compact stroller, this one is pretty good. I looked at many umbrella strollers and most did not have 5 point harnesses or aren't comfy for someone over about 5'2". Now I'm a hair under 5'8", but I wouldn't recommend this for anyone taller. My husband at 6' had to hunch over to push it. Another issue is that the wheels are pretty close together and the handles don't tilt back far enough to provide a lot of separation between your feet and the wheels. You do have to walk heel-toe if you are going to walk behind the stroller and that not only takes a little getting used to, but can be tiring because you don't use your normal walking muscles. It has a very small basket underneath that can store some smile items, but because of the cross back support, you can't put a bag of any size under there, but it's good for small purchases. Also, while it does recline, it's not much, but more than you would see on other umbrella strollers. Another plus is that it is significantly wider than the Jeep umbrella stroller and the other low price ones. My 3 month old looked cramped in that one and I cannot imagine her being able to use it for long. This stroller should last us for travel purposes (especially on the subway) for a couple of years. I also like that the sunshade can be snapped to the back of the stroller or you can unsnap it and change the angle depending on where the sun is. We purchased this stroller as an extra for around the house or quick trips out (in turquois) specifically for the shoulder harnesses because it's hard to find an umbrella stroller with this option. The stroller is well made and visually pleasing (thus the 2 star rating). unfortunately my average size 8 month old finds it extremely uncomfortable. The problem is that the seat part is too inclined and even with the back in the upright position it makes his feet point up too high. therefore he has the tendency to lean forward because of the unnatural angle and he cannot relax. He ends up slumped to one side with his head resting on the side bar. This one will only be used for around the yard for short periods. Prior to purchasing this stroller I bought the "Kolcraft Tour Sport? Umbrella Stroller With Adjustable Canopy ". It was nearly half the price of the Chicco. Although it did not come with shoulder harnesses, it's just as well made, the handlebars are foam padded and comes with a cup holder. The best part is that I use it daily inside the house and my son loves it. The seat is flatter and it reclines as well. He falls asleep minutes after strolling him around the house and even watches his "Baby Einstein" shows in it. It's the best money spent so far. I also recommend any of the Maclaren Strollers, pricy but worth the money. I use the XLR for shopping and outing trips and he has plenty of room and is comfortable. We bought this stroller for our 10 month old that was cramped looking in the narrow seat of the Jeep Wrangler All Weather stroller we bought four months ago at Toys R' Us. My husband is 6'6", and I'm 5'10" and he wouldn't even bother to push the old one because he had to bend over so much and even I was manuevering with just my wrists and fingertips because it was so close to the ground. We like the fun orange color, the five point harness is sturdy, the material is easy to wipe clean, it is easy to fold in a compact shape without having to wrestle with it to get it closed. It is easy to use with or without the sunshade. It folds just as easy with it attached, so we just keep it on there for baby's comfort since it is summer afterall. The stroller just weighs 11lbs and feels solid. The old one was heavier with smaller wheels (and a rougher ride), yet a bag on the handlebars would make it feel unstable and off balance. The mesh basket in the bottom is nice to have. You could put smaller purchases in it, while out shopping (a Target bag, a purse, or a few baby essentials and a bottle of water). It makes for one less thing to carry. Baby can recline slightly by way of heavy duty zippers on either side of the back of the seat. The ride is pretty smooth too and our little boy passed right out in it. I picked this stroller over others that I had seen because I needed a secondary one in the umbrella format just to keep in the back of the car for quick trips around town or when we travel with the little one. The big travel system just isn't feasable to haul around when running errands. I also like that it came with the sun shade (it snaps to the frame and also in the back for an enclosed environment easily) and with the carrying bag. So for going to grandma's or a football game, you could throw it in the bag like one of those pop-up camping chairs and sling it over your shoulders. Perfect for traveling and quick trips! We bought this stroller for a recent trip to Cancun and it was just perfect! We didn't want to bring anything expensive that could get damaged or lost but we wanted something nicer than just a cheap-o umbrella stroller. It is so easy to collapse and unfold, maneuvers great, is very lightweight, reclines slightly, is comfortable for baby, looks good and even comes with a little travel bag. My baby seems very comfortable in this stroller. He fell asleep in it a few time on our trip and has since on our evening walks and he has never fallen asleep in his big travel system stroller. I was able to recline the seat with him still in it without waking him up or bring it back up. It doesn't lay all the way down (probably reclines about 3 or 4 inches) but it is perfectly comfy for a little snooze. It is so easy to use that I have started using it around town for errands and quick trips. I was worried about some of the reviews of people staying their feet kicked the wheels or that it is too short. Honestly, I haven't had either of those problems. I am 5 ft 9 and my husband is 5 ft 10 and we are both comfortable pushing it. This isn't a stroller meant for a ten mile walk but it does it exactly what it is designed for. May be okay if you're short! I got this stroller in a local store mainly for shopping and doctors appointments. Ultimately, I've decided to sell it because I didn't want to own 3 strollers and this proved insufficient for vacations or longer errands. Small amount of recline - enough to sleep or provide a little support to a younger baby (I used this first around 4mo). The fabric is nice and it has a sturdy feel to it. At first, I was frustrated by the canopy, as it doesn't extend far. I finally realized that you can move it forward more if you unsnap it from the back of the seat. I couldn't do this on a similar Inglesina (more expensive) stroller I looked at, so it's worth noting as a positive. There's room for a small diaper bag in the basket. It doesn't tip if you hang something on the handles with the baby inside. I tried it out in the store, but I guess I never really walked at my full stride. Once I threw out the box, I realized that I can't walk behind this stroller for any length of time without kicking the wheels. I'm 5'6". My 6' husband has the same trouble and he generally walks slower than I. If I alter my stride to avoid the wheels, my back and shoulders wear out quickly. I also find it difficult to fold and lock. I end up laying it on the ground and using two hands. The locking clip is very tight, but without it, the stroller flops open easily. The locking clip has gotten a little better with multiple uses though. The recline is really slight. My son will sleep in this stroller if we put him in asleep, but won't fall asleep on his own in it. But he's a little finicky about sleeping, so I didn't take off a star for this. Best Umberella Stroller on the market for infant, toddlers, and kids.